We're spirit. We're souls. Most souls live happily with Krishna in the spiritual world. Krishna is the Supreme Being. Some souls—us—rebel against His authority and want to try to enjoy outside their relationship with Him. To fulfill—and reform—this unnatural desire, Krishna creates the material world. 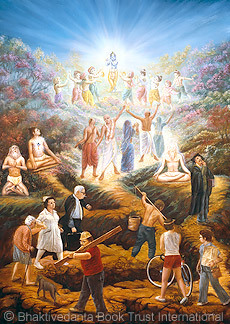 By constitution all spiritual souls belong in the spiritual world. Like fish out of water, we can never find lasting happiness in the material world. Here, we accept bodies subject to disease, destruction, and countless other miseries. Because we are here by choice, we cannot hold Krishna responsible for the suffering we must endure. Besides, in human life we always have the chance to give up our rebellious nature, cultivate our innate love for Krishna, and return to our home in the spiritual world. Because of His intense love for each of us, Krishna does not abandon us here. As the Supersoul, He accompanies us in whatever body we accept. And He sends scriptures and spiritually awakened teachers to reveal our true, spiritual identity and lead us home.